Far back in time, the ancient Greeks and even more ancient Thracians, who established their civilizations on this unearthly spot in the Devin valley, left us a legacy - a gift for the generations to come - wonderous springs of blessed and mystic waters, a magic. Devin is situated in the folds of the majestic and mythical Rhodopes in the Vacha river valley at an altitude of 684 meters above sea level,amongst the chillness of pine forests and fresh mountain air. Located is 220 km from Sofia and 35 km from the famous mountain and ski resort Pamporovo. 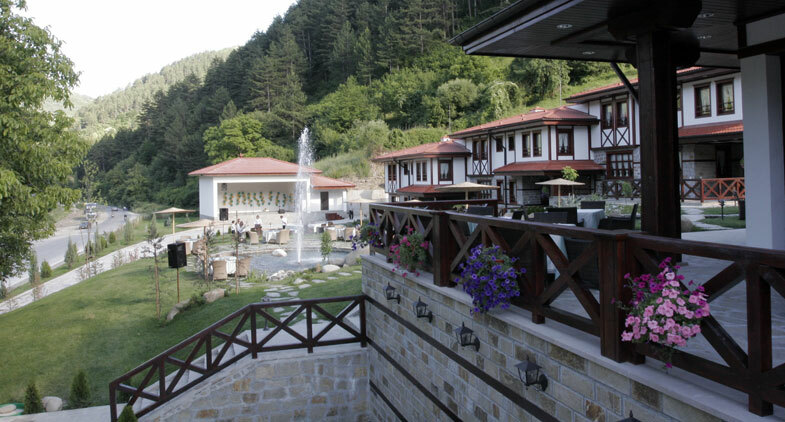 The resort boasts a various relief, picturesque surroundings, mild climate as well as several kinds of mineral waters. The curative properties of Devin's mineral water are due to their considerable mineralization, relatively high content of fluorine, mild acidity and high temperature - from 16 to 76 degrees C. It has a strong alkaline reaction (pH 9.4). The total usable flow is 1,800 l/min. Devin mineral waters are suitable for SPA and climatic treatment of of a wide range of diseases of the locomotory system, cardiovascular system and functional disturbances of the nervous system.